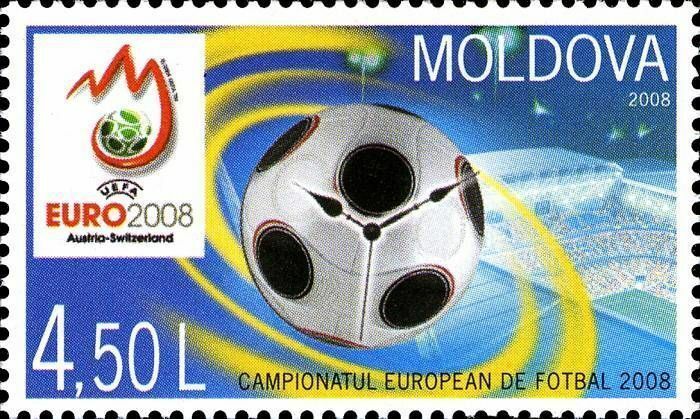 On 28 June 2008, the Post Office of Moldova (Poșta Moldovei) issued a postage stamp with the title UEFA European Soccer Championships «EURO 2008». The issue comprises one stamp, with an associated cancellation (postmark) and first day cover (FDC). The designer was Vitaliu Pogolşa. The printing was performed by Tipografia Centrală, Chişinău. The 2008 UEFA European Football Championship, commonly referred to as Euro 2008, was the 13th UEFA European Football Championship, a quadrennial football tournament contested by European nations. It took place in Austria and Switzerland (both hosting the tournament for the first time) from 7 to 29 June 2008. The second jointly hosted finals in the competition's history, the tournament was eventually won by Spain, defeating Germany 1–0 in the final; becoming only the second nation to win all their group stage fixtures and win the European Championship itself; an accomplishment matched by France in 1984. Spain were also the first team since Germany in 1996 to win the tournament undefeated. Read more.. This article uses material from the Wikipedia article 'UEFA_Euro_2008', which is released under the Creative Commons Attribution-Share-Alike License 3.0.